These are the pastries we usually have every day (except as otherwise noted). Flavors are subject to change with the seasons and whims of the chef. Crisp and flaky on the outside, light and tender on the inside, our croissants are made with a natural sourdough starter which also enhances the buttery flavor. 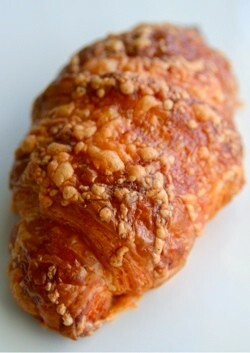 Spanish smoked paprika and cheddar cheese inside and out give these croissants a deeply savory and satisfying flavor. Our smoked paprika & cheddar croissants, filled with Black Forest ham and creamy cheese sauce, topped with more cheese sauce and grated cheese, then baked until it all melts together. Similar to a twice-baked almond croissant, these start with our regular buttery croissant, split open and brushed with orange flower syrup, then filled and topped with rich pistachio cream. Our chocolate croissant, filled with almond cream and sour cherries, topped with more almond cream, and baked again until toasty and crisp. A specialty of the Brittany region of France, these golden rounds are similar to croissants, but made with salted butter, rolled in sugar, and baked until the outside caramelizes and turns crunchy. We also make a chocolate version filled with creamy dark chocolate ganache. We usually offer three or four flavors of creamy fillings to choose from. 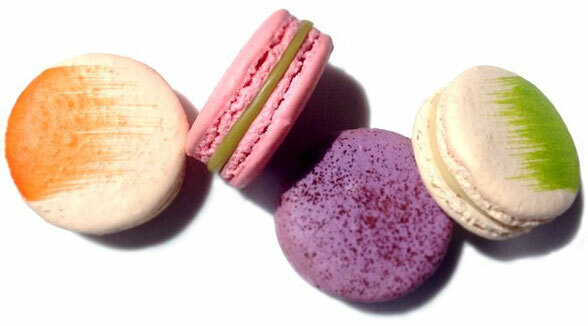 In the past we've had banana caramel, chocolate, coconut, blackberry, and apricot. Who knows what we'll do this week? 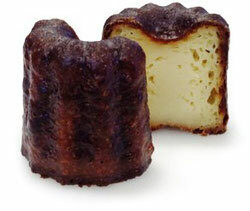 A unique pastry from the Bordeaux region of France, these are made from an eggy batter flavored with vanilla and rum. Baked in special little molds for a long time until the outside becomes a dark, mahogany brown and crunchy, while the inside stays soft and custardy. These are a bit more refined than the mall variety. Made from a "laminated" brioche (a brioche dough that is layered with butter like a croissant), they are flaky on the outside, light and tender on the inside. Not too sweet, with a smear of cream cheese glaze on top. Made with the same laminated brioche dough as our cinnamon rolls, our danish are light and flaky with a savory/sweet filling of goat cheese and home-made seasonal jam. We usually have two flavors of moist and tender scones every day, such as classic currant, apricot and stilton, or blueberry and lemon. These are the French classic - delicate almond meringue shell with moist, tender interior. We usually offer three flavors ranging from dark chocolate, to caipirinha (lime and cachaca), to yuzu and raspberry, to black currant, to whatever sparks the chef's imagination. Like a chewy Oreo, but with a more intense flavor and pure butter (no shortening) in the filling. The filling flavors may change occasionally, though coffee seems to be very popular. Similar to lemon bars, but made with exotic tropical passion fruit. Tart and creamy topping on a delicate shortbread crust. A classic French snack cake made moist and rich with browned butter and ground almonds. We bake ours with seasonal fruit inside. Soft and chewy, rich with the taste of browned butter, pecans and belgian chocolate chips. Delicately crunchy with the surprising taste of pink peppercorns and vanilla. Fruity and floral rather than spicy.